The ultimate love letter to the world’s most magical plant: Weed. 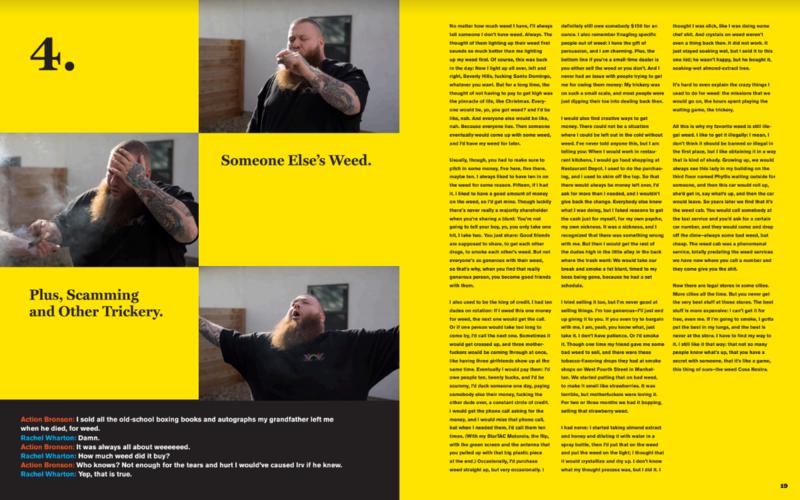 Bestselling author, rapper, chef, and television star Action Bronson is a marijuana superhero, and Stoned Beyond Belief (Abrams Image; March 19, 2019; U.S. $27.50; Hardcover), is his masterpiece. 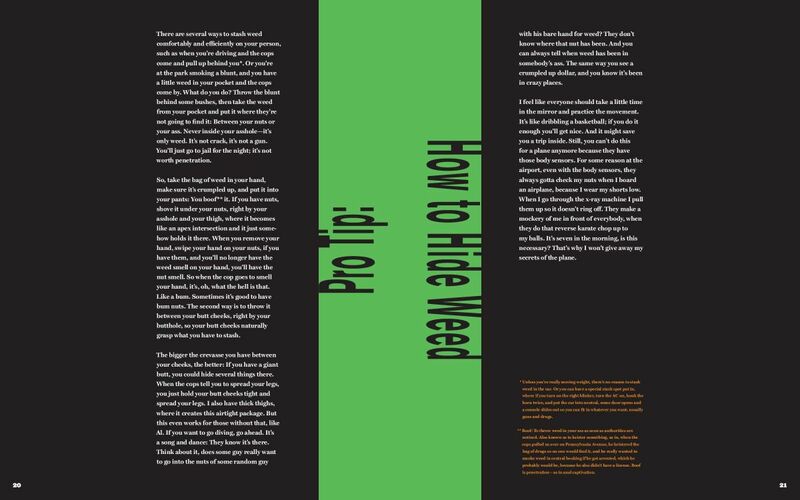 This is an exploration of every corner of the pot galaxy, from highly scientific botanical analyses and the study of pot’s medicinal benefits to a guide to the wild world of weed paraphernalia. It’s also a very personal tribute to a substance Bronson refers to as life-changing, horizon-expanding, a conduit for happiness, a connector. Weed is to Action Bronson what the madeleine was to Proust: the door to true consciousness. A multi-talented figure with expertise in all creative arts, Action Bronson is an enthusiastic and tireless worker. In November 2018, Bronson released White Bronco, his latest studio album and his first project as an independent artist since 2012. The follow-up to 2017’s Blue Chips 7000, White Bronco features production from Bronson’s longtime collaborator Party Supplies, as well as contributions from Knxwledge, Harry Fraud, Daringer, Samiyam and Bronson’s live band The Special Victims’ Unit. With a surreal front cover painted by the Queens-born icon himself, White Bronco showcases a liberated Action Bronson, free from constraints or distractions. Featuring appearances from A$AP Rocky, Meyhem Lauren, Yung Mehico, and Big Body Bes, White Bronco is available now on all DSPs via EMPIRE. With a constant slate of tour dates and TV appearances, and a busy schedule of recording, writing, and even painting, Action Bronson just might be the hardest-working man in show business. This week, Bronson embarks on a promotional blitz to get the word out about Stoned Beyond Belief, including appearances on this morning’s Good Morning America on ABC and tonight’s Late Night With Seth Myers on NBC. Bronson will also appear in person at release events in Manhattan and Long Island. See below for event details. At this event, Action Bronson will sign copies of his latest Abrams release “Stoned Beyond Belief.” With each $50 purchase of the book, guests will also receive the “1,000 Pound Gorilla” specialty ice cream sandwich (While supplies last). The “1,000 Pound Gorilla” ice cream sandwich is a collaboration between Action Bronson and Nick Morgenstern of Morgenstern’s Finest Ice Cream and made of: banana pudding ice cream, vanilla wafers, banana dip, and caramel crunch. 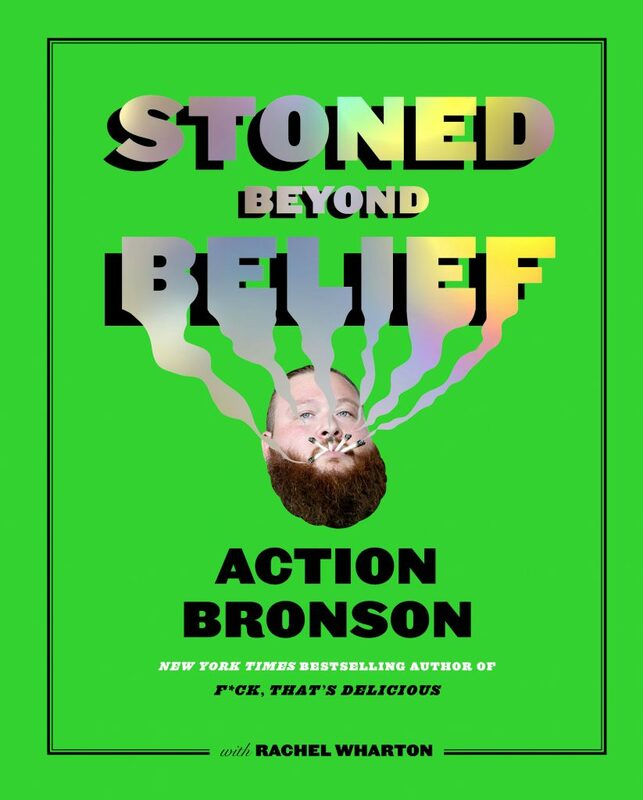 Join us for an evening with Rapper and New York Times Bestselling author of F*ck, That’s Delicious, Action Bronson as signs his new book, Stoned Beyond Belief. IMPORTANT! All books signed at Book Revue events should be purchased at Book Revue. If you purchase the book prior to the event please save your Book Revue receipt. If you have purchased the book from somewhere else you can still get your book signed, we just ask that you make a purchase in our store of equal or greater value to that of the book. A burgeoning media mogul and a celebrated figure in the culture, Action Bronson never stops working. Born Ariyan Arslani, Bronson started his career as a gourmet chef, rapping only as a hobby, until he garnered overwhelmingly positive critical attention with his first mixtape Dr. Lecter, released in 2011.Packing his rhymes with references to fine food, culinary practices, professional wrestling, obscure sports figures, and more, Dr. Lecter and its popular follow-up Blue Chips quickly built Bronson’s reputation as a lyricist. Singing to Atlantic Records through a partnership with VICE, Bronson charted at #7 on Billboard with his major label debut Mr. Wonderful in 2015, which featured the Gold-certified single “Baby Blue,” featuring Chance The Rapper. Since the release of that album, Bronson expanded into filmed media, starting a web-based mini-series for Vice entitled “Action in the Kitchen,” which played off the artist’s love of food and music. The success of “Action in the Kitchen”led to “F*ck, That’s Delicious,”a full-fledged TV series and a flagship show on Viceland, where Bronson travels the world, meeting chefs and cooks and tasting everything from haute cuisine to street vendor favorites. Bronson also released a cookbook of the same name, which spent several weeks on the New York Times Best-Seller list. Bronson expanded his television empire into the realm of the metaphysical with Viceland’s 2017 series “Traveling the Stars: Ancient Aliens with Action Bronson,” and he currently hosts “THE UNTITLED ACTION BRONSON SHOW,“ a free-form talk show on Viceland. Bronson ended his relationship with Vice in 2018 and independently released his album White Bronco on November 1st. Bronson’s second book Stoned Beyond Belief hits stores on March 19th via Abrams Publishing. In November 2018, Bronson released White Bronco, his latest studio album and his first project as an independent artist since 2012. Featuring appearances from A$AP Rocky, Meyhem Lauren, Yung Mehico, and Big Body Bes, and production from Party Supplies, Harry Fraud, Daringer, Samiyam, and and Bronson’s live band, The Special Victims’ Unit, White Bronco is available now on all DSPs via EMPIRE.